Web Phone | CTI Internet Phone Software | Web Phones | Internet Soft phones. Connect your web applications to our call center phone system using our web phone. Rather than modifying your web applications by embedding phone keys and functions in your code, simply let our web phone invoke your browser applications. Our web phone consists of an application running on your Windows PC that manages the user connectivity with your phone system. The Database Web Phone connects to our PACER (digital) and WIZARD (analog) Series of phone systems. Extensive reports, statistics and graphs are included with this Softphone to help you effectively manage the use of your phone system. Our web phone functions on your Local Area Network (LAN) or over the Internet, enabling your employees to work either in your corporate offices, satellite remote offices or from the convenience of home. Contact DSC to learn more about our web phone software and internet phone systems. 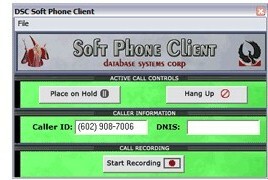 Phone systems from Database Systems Corp. are state-of-the-art computer telephony systems that handle inbound and outbound phone calls. Our phone systems and web phone application software support various different inbound and outbound phone campaigns. Inbound Call Answering - Our softphone application can process inbound phone calls that are distributed using our phone system's ACD (Automatic Call Distribution) system. With our IVR (Interactive Voice Response) system, callers can perform self-help functions without speaking with your agents by making simple selections using the keypad on their phone set. Our phone system can connect these calls our softphone applications that are running on your local network or over the internet. Outbound Dialing Campaigns - Our softphone application is also capable of processing outbound phone calls including dial on demand, Predictive Dialing, progressive dialing, and preview dialing - all at the same time. For further information, please visit our Predictive Dialer webpage. Blended Call Operations - The Database Systems Corp. phone system and softphone application software are capable of performing both inbound (IVR solutions) and outbound calling functions simultaneously. This blended call capability makes our softphone and phone system ideal for call centers. Our standalone softphone is a PC program that includes our softphone API routines. This program can be developed in C/C++, Visual Basic, Active X Control, .NET Control and other PC programming protocols. 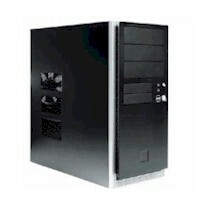 Database has developed a number of softphone models that can be used as standalone applications on your agent desktops. We also can customize your softphone for the look and feel that best suits your organization. And with our extensive software library, you can develop your own PC softphones. 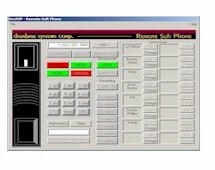 Our extensive Softphone library can be embedded in your PC applications, effectively "CTI enabling" these applications. Phone information can be passed to these PC applications which can be launched based upon a phone event such as a received phone call. Applications can be written in C/C++, Visual Basic, Active X Control, .NET Control and other protocols. Refer to our Softphone API manual. Our softphone functions can be embedded in your existing Web application. Phone functions can be initiated from your browser application. The above example demonstrates the use of our phone functions within a browser based application. Phone buttons can be embedded anywhere in your web application, connecting your users with our phone systems. This option provides limited phone functionality due to the asynchronous nature of web operation. Our internet phone can control web applications offering complete navigational control of web pages and applications based upon phone events. 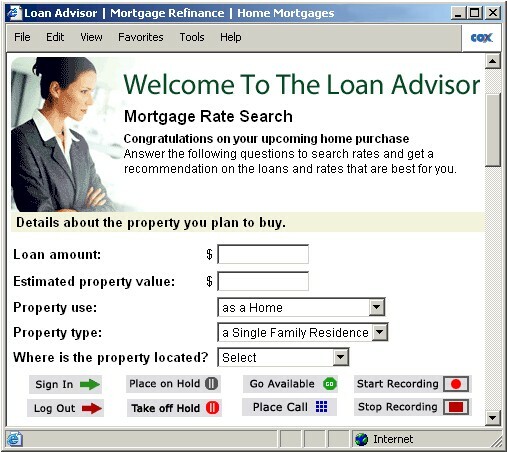 The web phone controls which web page appears based upon a phone event such as the receipt of a call. This feature provides the maximum internet phone control and allows the web phone to launch web pages passing variable information to each page as it is displayed. 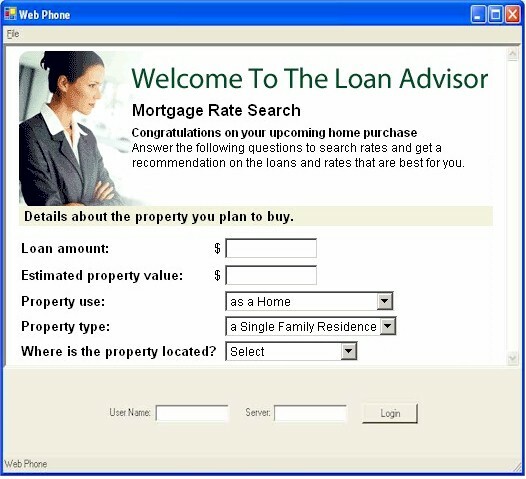 The above example demonstrates the use of our web phone that is controlling a web application. The web phone controls phone functions including logging into the phone system, placing calls, etc. 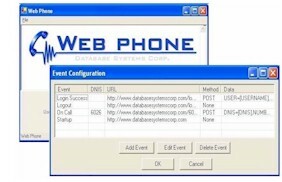 When the phone system notifies the web phone of an event, the phone can be configured to invoke any application web page. This option provides the most robust phone functionality. 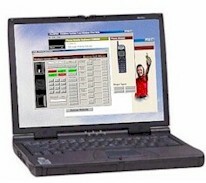 Our web phone can be configured to respond to any number of phone events. These events trigger the invocation of a unique web page (per event) and parameters can be passed to this page. Our softphone and library support many phone features. The following are just a few of these computer telephony functions. The graphic buttons are just examples and can be tailored to fit your specific phone applications. - This function allows a user to login to our phone system. - Likewise, a user can log off from our phone systems. - Make a user available to make or receive calls. - A User can initiate a phone call through our phone system. - User can place a call on hold. - User can take a call off hold. - A user can start recording a phone conversation. - User can stop recording the phone conversation. - A user can hangup on a phone call. - Make a user unavailable to make or receive calls. The above list is just sample of the functions that can be performed by our soft phone library. For a complete listing of these softphone functions, view our online Softphone API manual. An important benefit of today's telecommunication advancement is the ability for your employees to work from home. Database Systems Corp. has developed a family of telecom products that facilitate and promote this capability. Our CTI Software, combined with our PACER call center phone system, fully supports remote agents. Now your workforce can be significantly expanded with the addition of work at home employees. The economic savings and environmental advantages are significant. To obtain additional information about our remote agent capability, you may view our Remote Agent page. 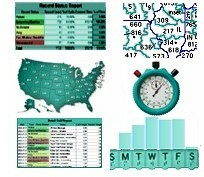 A key feature of our internet phone software system is the ability to generate real time reports and graphs. This important measuring system helps you observe and control the performance of your call center and phone system with clear and meaningful displays. Graphs and charts of operational statistics let you measure the effectiveness of each user and campaign. Reports and graphs include both inbound and outbound statistics. The information contained in each of these reports can be downloaded into a spreadsheet format for individually customized reporting. 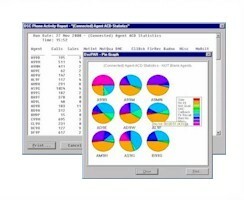 A complete sample of the reporting capability of our CTI software can be seen by clicking on the graphic to your right. DSC offers an affordable analog dialer. This 4 line system includes our softphone or comes optionally with our comprehensive software development toolkit. Phone campaigns can be developed using our setup utility or we can provide you with a custom auto dialer campaign. These applications can be easily ported to our digital T1 phone system (PACER) when your call volume requires a larger system. Calling campaigns can be quickly developed that call numbers from a phone list and when contact is made with an individual, the call can be routed to your online agent or to a work from home employee. If an answering machine is detected, a different message could be left on the machine. This entry level auto dialer can be easily expanded by adding additional agent lines and software to support a small call center operation including complete CRM applications. DSC provides voice broadcast software including our VB wizard development tool for creating voice broadcasting applications. This wizard guides you through each step when defining your VB applications. Comprehensive phone applications can be developed quickly. Simply record your phone prompts and fill in the blanks. For an up-to-date list of CTI internet software functions, visit our CTI Softphone API Library web pages. Contact DSC to learn more about our computer telephony integration software and web phone software.